Walking down the block today in New York City, I noticed a dozen famous trademarks: WHOLE FOODS MARKET (store sign), NYC TAXI (decal on a cab); LOUIS VUITTON (purse), 7 ELEVEN (store sign), CON EDISON (on a service truck), UNITED STATES POSTAL SERVICE (on a blue mail box), DUNKIN’ DONUTS (store sign), POLO RALPH LAUREN (logo on a man’s shirt), NIKE (swoosh on a shopping bag); HAAGEN-DAZS (on an ice cream delivery truck); GAP (store sign) and MTA (logo on a poster announcing a subway update). Once a trademark has been registered with the USPTO, the trademark owner is vested with a bundle of exclusive rights to use the trademark AND the owner also has the right to use the coveted Registered Trademark symbol: ®. 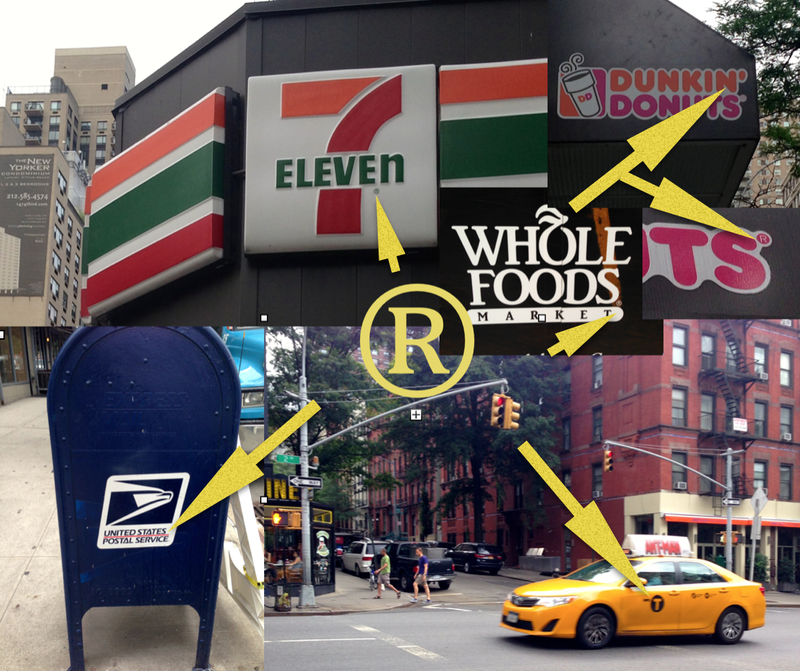 The photo-collage inserted into this post points out several uses of the ® symbol that I noticed out on the street. [Y]ou may use the federal registration symbol “®” only after the USPTO actually registers a mark , and not while an application is pending. Also, you may use the registration symbol with the mark only on or in connection with the goods and/or services listed in the federal trademark registration. Registered trademarks are all over the streets of New York City! See also: Other blog posts on using trademark symbols at https://iplegalfreebies.wordpress.com/category/t-r-a-d-e-m-a-r-k/trademarks-tm-sm/; USPTO (U.S. Patent & Trademark Office) resources at www.uspto.gov and www.uspto.gov/faq/trademarks.jsp#_Toc275426682; INTA (International Trademark Association) fact sheet on trademark use at http://inta.org/TrademarkBasics/FactSheets/Pages/TrademarkUseFactSheet.aspx; @iplegalfreebies and www.kasterlegal.com. Once a trademark is federally registered with the USPTO (US Patent & Trademark Office), the coveted ® symbol can be used. While use of the ® symbol is not required, it is highly recommend. Using the ® symbol lends credibility to a registered mark. Additionally, it puts potential infringers on notice of the trademark owner’s rights and makes it easier for the trademark owner to collect certain damages in the event someone infringes these rights. 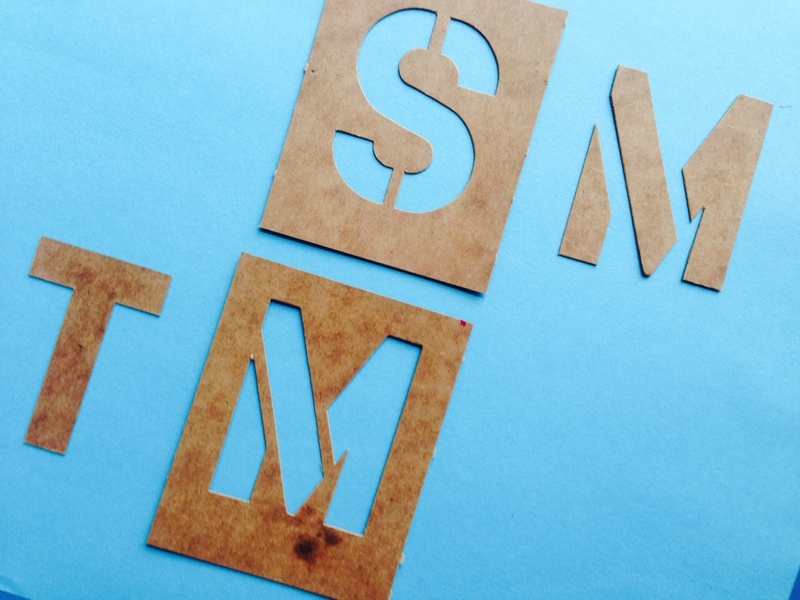 The TM and SM symbols can be used with an unregistered trademark or service mark to inform the public that a word mark, logo, or design mark is being used as a trademark and that the owner of the mark claims rights to it. Using either of these symbols gives notice that the mark owner is intentionally establishing ‘common law trademark rights’ in the mark. For example: MY TRADEMARK ™ or MY SERVICE MARK ℠ (For more information on how to use the TM or SM symbols click here). Another familiar symbol is the copyright symbol. Using the © symbol is an easy way to notify the world that copyright exists in your original, creative work. While it’s not required by law to use the © to establish copyright in a photograph, piece of music or other original work, it’s simple to do and could save you a lot of headache down the road. Use of the the © copyright symbol does not require permission from, or registration with the US Copyright Office. (For more information on how to write a © copyright notice click here). Many creative works may contain both a trademark symbol and a copyright notice. A website, for example, will often contain the website owner’s trademark (registered or unregistered) and a copyright notice. A novel may have the publisher’s registered trademark and the author’s copyright notice on it. See also: USPTO (US Patent & Trademark Office) resources at www.uspto.gov; www.uspto.gov/trademarks/basics/register.jsp; and www.uspto.gov/faq/trademarks.jsp#_Toc275426682 ; US Copyright Office Circular 3 on Copyright Notice at www.copyright.gov/circs/circ03.pdf; US Copyright Office Circular 1 on Copyright Basics at www.copyright.gov/circs/circ01.pdf; @iplegalfreebies and www.kasterlegal.com.